British Airways cabin crews have struck for three days in a dispute which is quickly taking on the status of a set-piece battle between workers and management. With a general election weeks away, the political parties have attempted to outdo each other by laying into the strikers, with much of the media in tow. Much media coverage has been given to the disputed amount of disruption caused by the strike. BA has claimed that 60% of its passengers have flown as normal, while Unite has said that only a few thousand passengers have been shifted. BA's spin machine has gone into overdrive, with BA chief Willie Walsh plastering himself all over YouTube (Walsh, who has described the union's offer as “morally wrong” took home an annual salary of three-quarters of a million pounds in 2009 despite BA making record losses, an increase of 6% on top of a boost to his pension fund). Management is trumpeting the supposed success of its 'contingency plans', relying for the large part on scab labour, and chartered flights run on behalf of BA by other airlines. Okay guys, i've just sifted thru BA.com to get a rough idea of how many flights took off today, as the BA Walsh Spin machine is in overdrive, saying that 65% of the schedule departed. 135 of those flights were cancelled. that leaves 141 BA departures from Heathrow today right? Erm, no. 9 flights to Spain were Iberia aircraft. 4 flights included in those figures were BMI to Damascus, Tehran, Beirut and Almaty! 3 flights to BKK, HKG, SIN were Qantas. That leaves us with 102 departures today. These figures include those wet leased aircraft, and flights that left as cargo only with no passengers. I believe the number of chartered aircraft was 23. Assuming they just operated one flight each ( it's more likely they flew a couple each ), that leaves us with 79 BA aircraft departing, some without and some with very few passengers. That's 28% of the schedule. 28% !!! That's a far cry from Walsh's 65%. It's there for all to see. Walsh's figures are pure fantasy. Keep strong and keep the faith. Don't believe a single word of the BA Hype. On the other hand, 'independent rebuttals' of the union's figures well reported by the media, such as those on Steven Frischling's blog, have relied heavily on BA's own figures. At the same time, there has been little information to what extent the BA staff “reporting to work” are supervisors and staff from other parts of the company taking on scabbing duties. Reports of stand-in cabin crew taking up their responsibilities of only a few hours' worth of training suggest this is the case, and is not surprising given the massive mandate that the strike received from Unite membership – an 80.7% yes vote to strike action on a 78.7% turnout. On the other hand, the paltry 'offer' Unite are fighting for which includes a 2% pay cut and the levels of management bullying will inevitably have led to scabbing by demoralised crew (more below). Meanwhile, management's bullying has reached new heights as BA carries through its threats to discipline anyone taking sick leave over the strike days. A seriously ill crew member on bed rest who is at risk of losing her baby has been suspended, as has a worker recovering from surgery. A worker off caring for a seriously ill child was instructed to bring the child to her disciplinary hearing. A number of crew members have been signed off with stress and depression, with one being sent to an urgent treatment centre. In every instance, BA's health services have overridden the decisions of GPs. • Expressing dismay regarding a graffiti board set up by BA management where staff were encouraged to scribble words of support for the company, on which was written "cabin crew scum." BA management has also undertaken a campaign of bullying against union reps. A union rep responsible for running an online discussion forum for union members has been issued with a 45-page legal document demanding the identities of 32 crew members posting under pseudonyms. 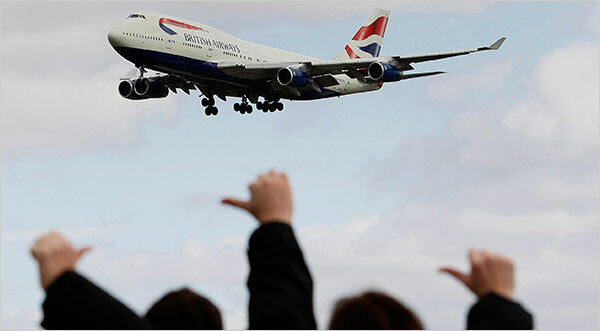 BA bosses are also threatening to take away travel privileges from workers involved in the strike action. This has led to terror on the part of staff who rely on them to get to work – one statistic claims that a quarter of BA staff live abroad, relying on travel perks to do their jobs. The threat to withdraw these privileges is an attempt to scare workers out of taking strike action. An ongoing dispute with BA baggage handlers, also Unite members, could lead to further strike action. Negotiations have been ongoing for some time - planned 48 hour strikes at the Christmas/New Year period were postponed by Unite to allow talks to continue. Meanwhile, Europe faces a wave of strike action in the air industry. Air France crews walk out for four days beginning Sunday, in defence of pay and conditions. Baggage handlers, cabin crews and pilots at Italian firm Alitalia struck for four hours at the weekend. TAP Portuguese Airlines pilots will strike on the 31st of March, while pilots at Lufthansa, Lufthansa Cargo and Germanwings will begin a four-day strike on April 31st. With the press laying into the striking cabin crews, the Tory party invoking the spirit of Thatcher and the need to challenge the “entrenched interests” of the Trade Unions, and the Prime Minister, Chancellor and Transport Secretary describing the actions of the Labour party's biggest donor as “reprehensible” and “deplorable”, it could be easy to buy into the guff about a “Spring of discontent”, mirroring the industrial unrest which brought down the last Labour government. Unlike many of the strikes of the “winter of discontent” of 1978-79, which were an attempt to secure better remuneration for workers in the wake of a nationwide pay freeze under Callaghan's government, this strike is entirely defensive. When picketers hold placards saying “we offered a pay cut!”, there are clearly problems. Unite's offer to BA accepted the company's terms of reference entirely, and the need for frontline staff to pay for the company's woes. The dispute is over the imposition of these attacks, and the precise form they take, not the necessity of the attacks themselves. Unite has acted like a junior management partner, angry at being sidelined. A pay cut is unlikely to be what BA crews imagined they'd be fighting for when they delivered an overwhelming mandate for strike action. Nonetheless, with all the political parties united on the need to impose austerity on the working class in coming years, the struggle of the BA cabin crews deserves support and solidarity. There's a great deal of combativity and inter-generational solidarity expressed in this strike that was evident in the reaction to the first vote at the racecourse some months back. Our solidarity should go to these workers fighting in particularly menacing and threatening conditions as well as in an atmosphere of media poison. This struggle of the workers can only be supported by revolutionaries but they also have a responsibility to be clear about the role of the unions. Apart from the frustrations of individual union leaders taking place within the "democratic process" there's the more profound role of the unions in subverting and dividing this movement which is still going on. The divisive union agreements of the Gatwick BA workers are a case in point. I also read somewhere yesterday that the union has already agreed to certain elements of new, inferior conditions being applied to new workers. And about two weeks ago BA sent out provocative individual letters to its 4500 baggage handlers and ground staff on working arrangements that Unite has responding to with "we are considering a ballot". The role of the unions in this instance is clearly to maintain the division of the workers. The great promises of "international solidarity" that unions like the Teamsters were making in relation to the strike seem to be the usual hot air. What is important in this respect, and mentioned above, is the simultaneity of the struggles, though not just in this sector, across Europe. I have heard that too - about Europe. Could you please refer to examples and perhaps how they are linking with each other? Thanks! that's a great and detailed article, thanks - did you write it yourself? If so, you should get an author pseudonym of your articles so that people who like them can find more similar. One quick point on sub editing - articles about strikes should have the tag "strikes". I will add to this if I get a chance. Cheers again though, great stuff. There's simultaneous struggles but, as far as I can see, no evidence of any linking up - even at Heathrow itself let alone with baggage handlers and ground staff, Heathrow/Gatwick and beyond. As things stand it's looking somewhat grim for the Heathrow strikers. The union/management set up and trap has been sprung and the position of the strikers at the moment looks to be getting weaker and weaker. Some workers are losing enormous amounts of wages. For example, going on strike on a day of or before a long-haul flight can cost the worker up to 12 days wages when rest days and wages from 2 or 3 stopovers are taken into account. Unite bleats about "fairness" and appeals to BA shareholders to intervene in order to get them off the hook. But it is responsible, along with management, for this set-up. Len McLusky, Unite assistant general secretary, says today, talking about pilots, etc., doing the work of cabin staff: "dividing your workers up like this is madness". This is rich coming from a union that has developed the division of workers in this important and centralised industry into a fine art.